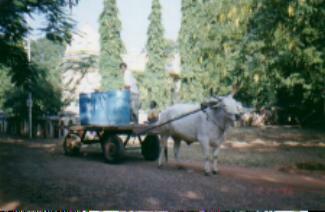 Bullock cart inside the park. 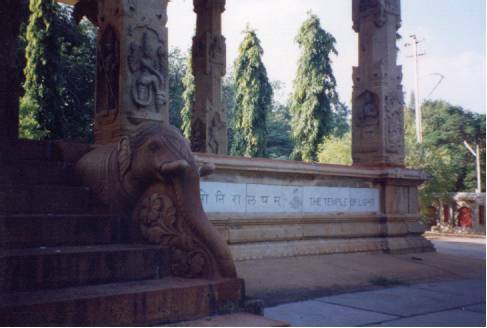 Gate to Hindu temple in the park. Notice place to remove shoes near to entrance. Outside of temple building inside gate. 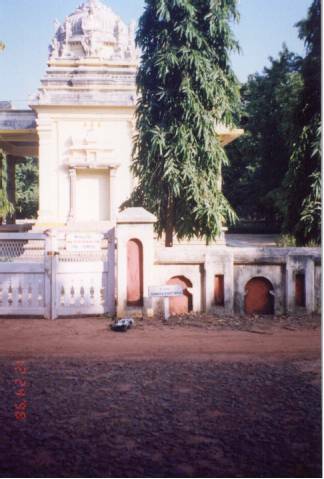 These pictures were taken in the Theosophical Society of Chennai. This society was started in 1875 with the help of Annie Besant, a foreigner to India, who wanted to revive Hindu culture and values back to India. The society is a gated park open only a few hours in the morning and in the evening. It is full of forests, nice buildings, and quiet, serene walkways. There is a Hindu Temple, as pictured to the left, and a Jain temple. I heard there is also a church and Buddhist temple on premisis, but I have not yet seen those. However, it is most known for having the largest banyan tree in the world. People do live in private residents inside the campus, there is a post office and a book store with very nice books on philosophy. The entry gate is easy to miss if you aren't looking. It is right past the Adyar flyover heading out of Adyar towards Mylapore, if you go over the bridge, you've gone too far! As I also came to find once, if you cross the street and go inside past the Malar Hospital, you will find a nice government library. But they collect your bags, so don't carry a lot with you.